So today we’re heading back to the kitchen with one of my Marley Spoon reviews. 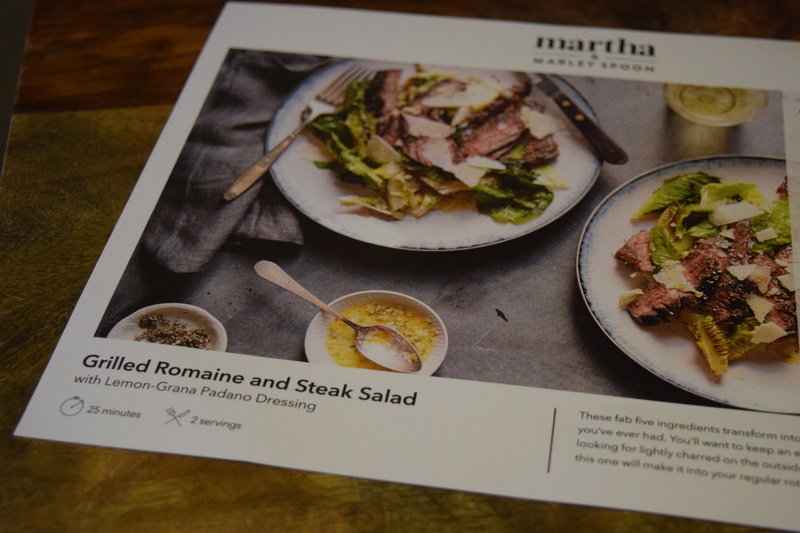 If you’d like to try it out this weekly meal subscription service for yourself, use the coupon code COOKSMART for $30 off. I also discovered the link to download the recipes cards. So you too can now attempt these recipes at home! 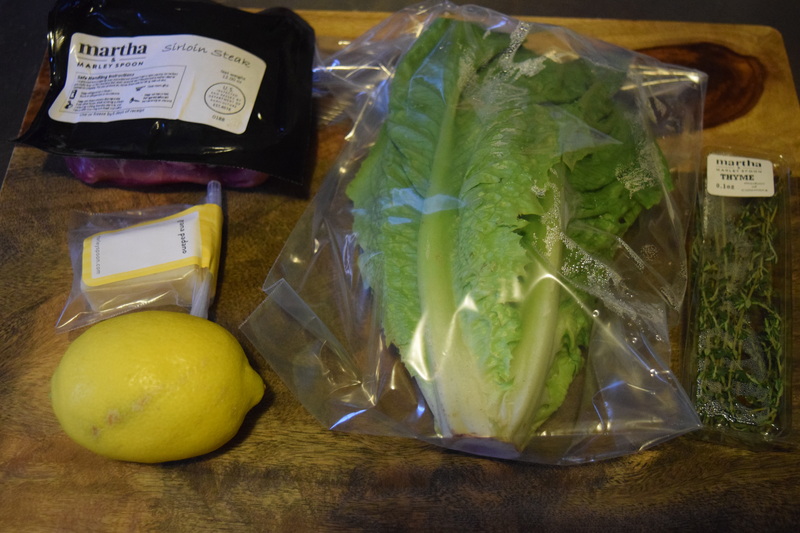 Marley Spoon always has excellent quality beef and I’ve never grilled romaine before so I thought I’d give this one a shot. We need to season the romaine and then we grill it. Unfortunately, I feel like the grill time was a bit too long since I ended up with very little romaine. I really don’t think there’s enough to account for two salads. 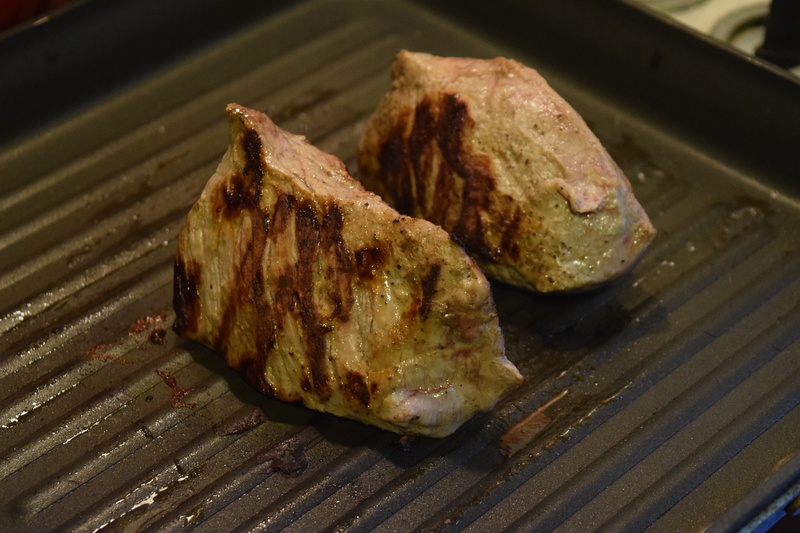 The steak gets grilled, while we make the dressing. 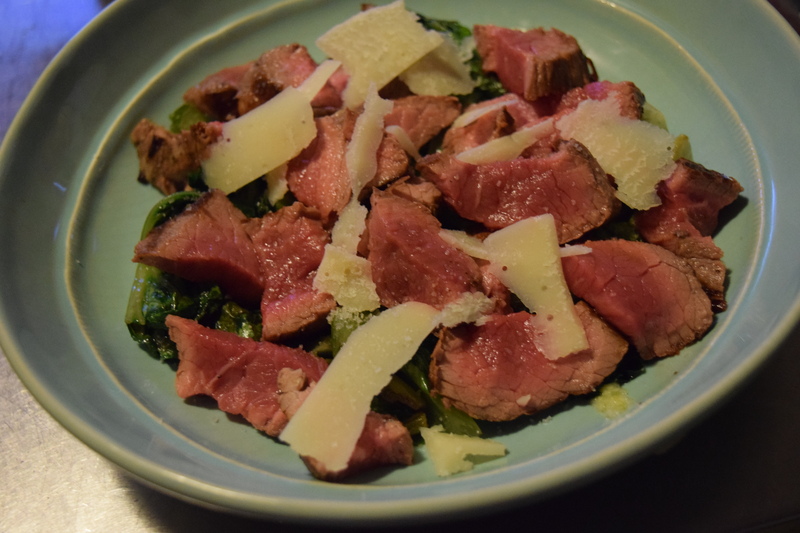 The romaine and steak gets sliced. 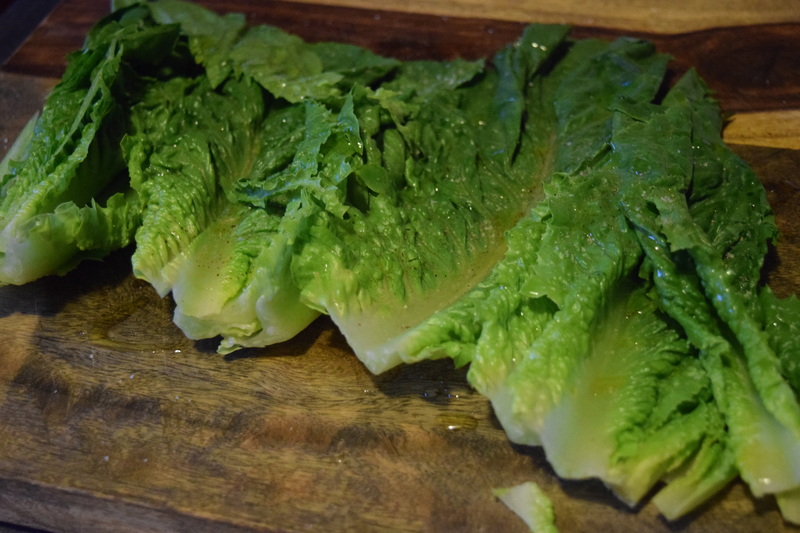 This is all the romaine I had with just one of the steaks sliced. I just don’t think there was enough romaine for two salads. Thankfully my boyfriend wanted to use his steak and cheese to make a sandwich so all the romaine went to my portion. In the end this was my salad – using half of all the other ingredients and all of the romaine. This had a nice taste although the dressing was a bit strong on the lemon flavor. While the dressing had cheese, it wasn’t particularly creamy and I think a touch of something like greek yogurt would have added another element to the dish. 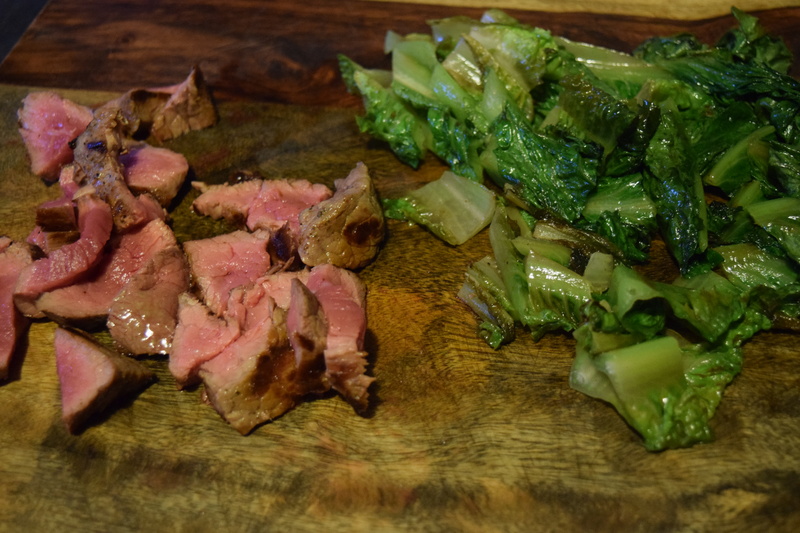 This recipe was easy to put together, the ingredients were excellent quality and I did find the process of grilling romaine interesting. Portion Size: Problematic. Plenty of steak, cheese and dressing. Not enough greens. Good for Entertaining? : No. I just don’t think the salad is interesting enough for entertaining and this isn’t something I could make ahead. 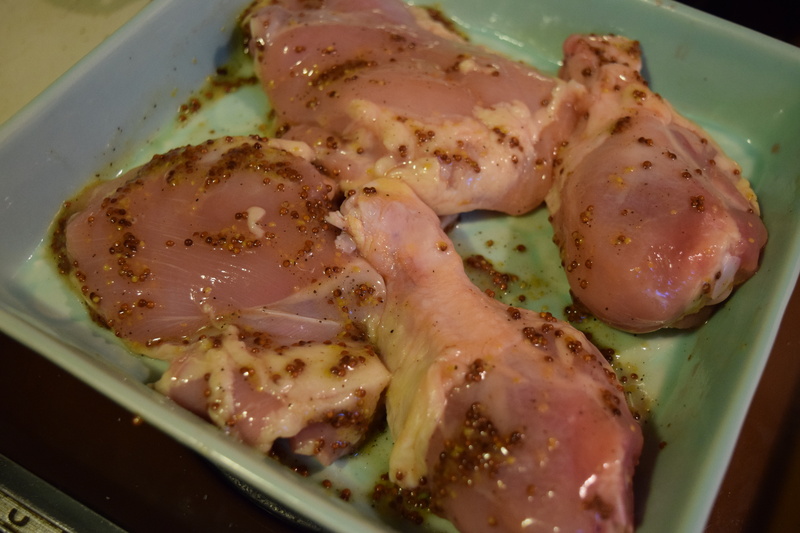 So we start by making some honey mustard and then marinating the chicken in half of it. We boil the potatoes and prep the other produce for our potato salad. The chicken grills and we periodically baste it with the extra money mustard. 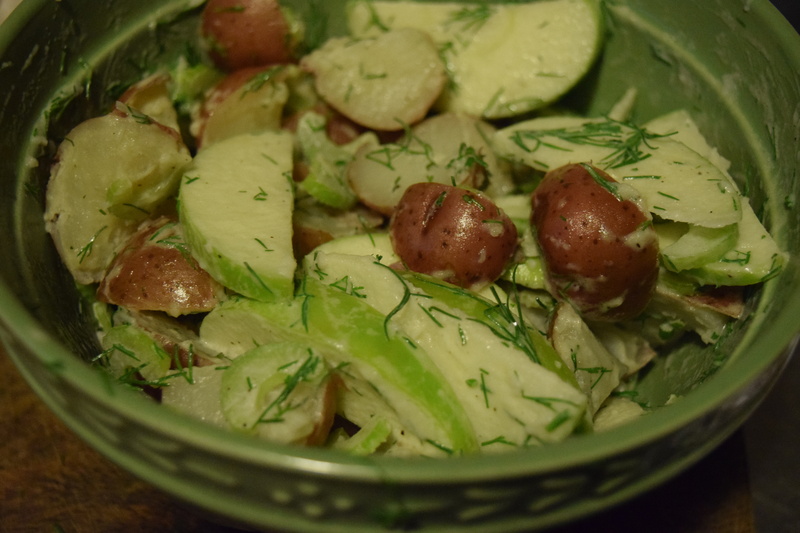 The salad comes together will potatoes, celery, dill, apple, mayo, vinegar, potatoes, olive oil and salt and pepper. 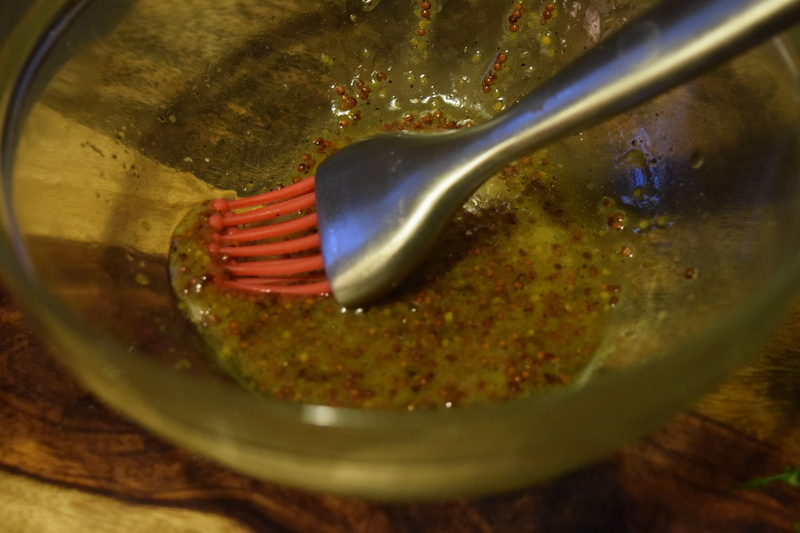 I’ve had a lot of honey mustard, but the marinade on this one was awesome–whatever mustard Marley Spoon is sending is just amazing. 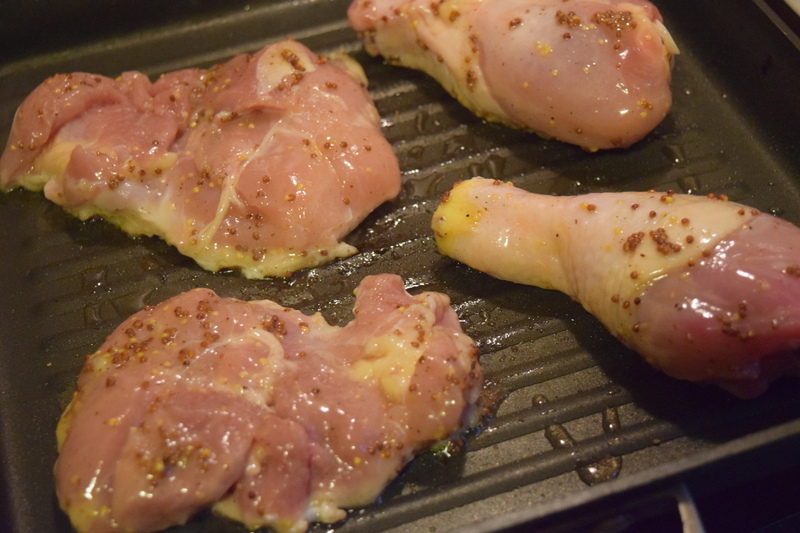 There were some issues with the chicken – having two cuts of chicken meant they cooked at different speeds. It would have been much better to have all one cut. Personally, I’d have opted for boneless chicken thighs. No fuss or muss and lots of flavor. As for the salad, I was initially concerned about how these flavors would pair but it was delicious and refreshing. 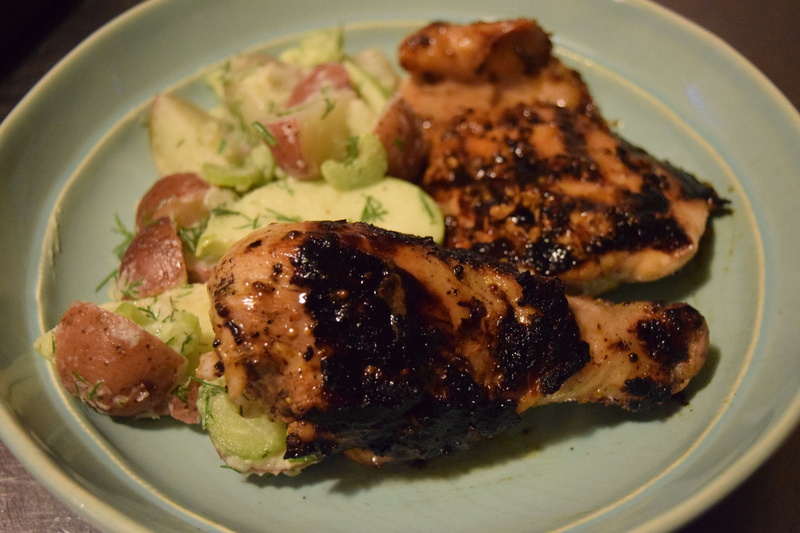 The dill really married well with the apples and complimented the chicken nicely. Good for Entertaining? : Yes! I’d definitely use this for a barbecue with dishes served family style, and just make some small modifications. 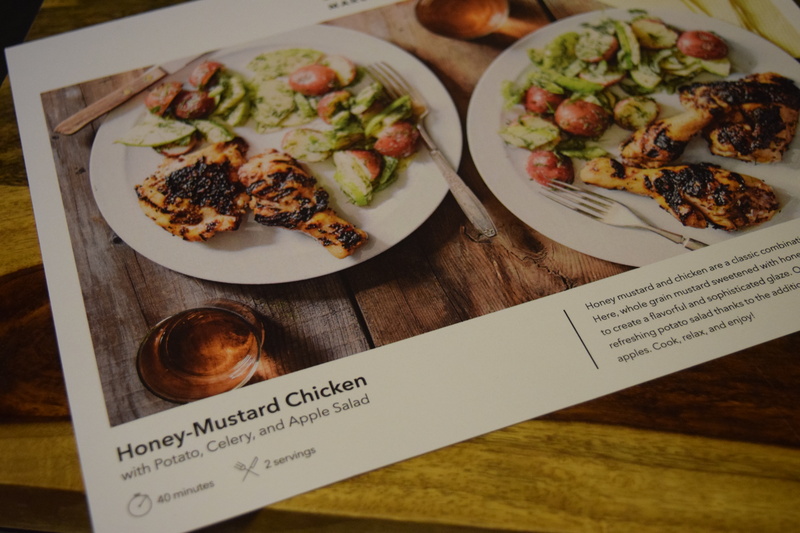 I’d opt to do boneless chicken thighs and while I liked the salad, I’m not sure it would be as popular at a party so I’d sub the apple in the recipe for hard-boiled egg. For additional mains, I’d serve chicken and beef hotdogs and sausages with rolls and tons of toppings. Additional sides would include a corn salad and a tortellini pasta salad. For drinks I’d have an assortment of beer, brewed iced tea, and white peach sangria. For appetizers, I’d include roasted shrimp cocktail and a simple and tasty spinach dip with an assortment of chips and veggies for dipping. Dessert would feature a fruit salad, cheesecake brownies and apple pie streusel bars. 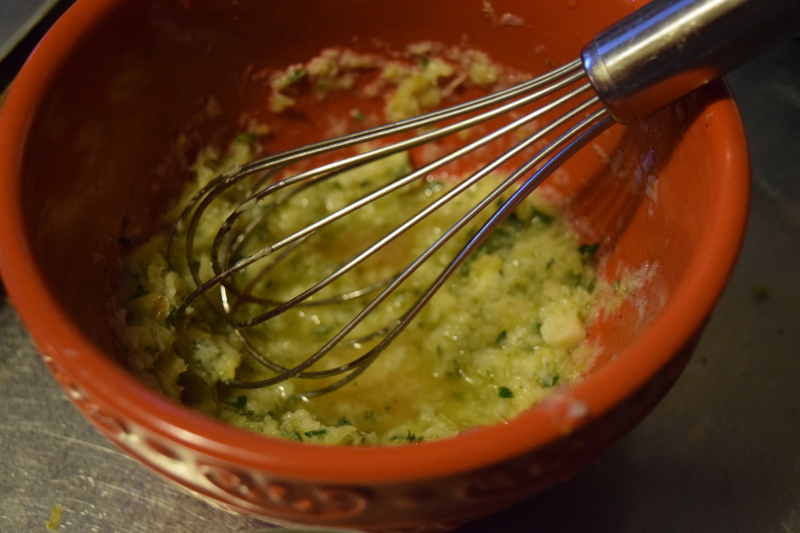 Both recipes had appealing flavors that offered me techniques and ideas I could use in my recipes and entertaining. My only issue with this box are the practical problems of not having quite enough romaine and the different chicken cuts requiring different cooking times, which is why it didn’t get a higher rating. 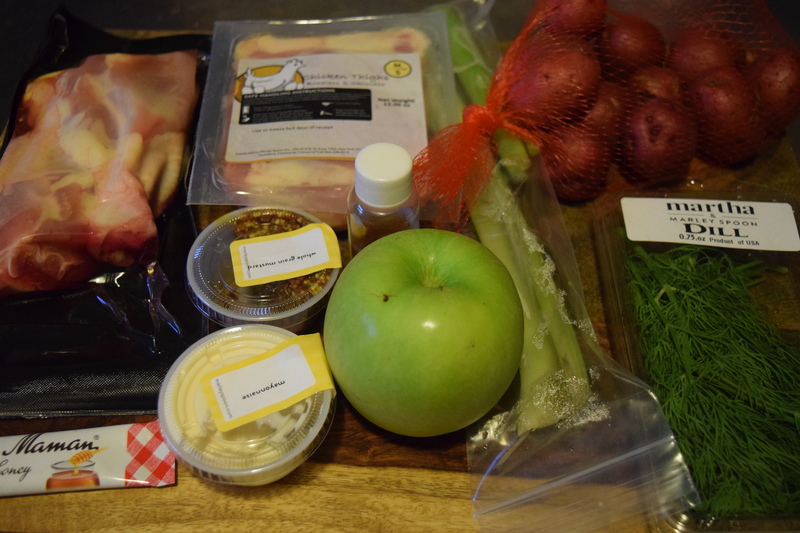 Have you tried any food subscriptions? If so which one, and what did you think? Previous article	← Julep Maven: July 2016 Into the Sea! Plus 20% Off!